Plan Geometral de Paris et de Ses Agrandissements a l'Echelle d'un millimetre pour 10m. (1:10,000). 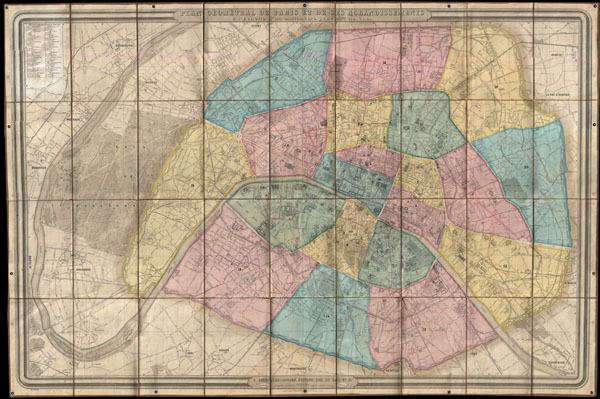 A stunning achievement, this 1860 map by Andriveau-Goujon is the largest folding map of Paris we have ever encountered. Measuring some 41 x 62 inches, this massive plan covers from Saint Cloud to Charenton, inclusive of the full curve of the Seine, the Bois de Boulogne, and the embastilled center of Paris. This map was drawn, as the title suggests, to illustrate Haussmann's 'agrandissments' or renovations of Paris under Napoleon III. The detail throughout is nothing short of astounding with every street, park, square, important building, bridge, and monument duly noted. Haussmann's proposed renovations are especially emphasized with his trademark grand boulevards intersecting with and often overlapping older streets and squares. The central portions of Paris are highlighted in Andriveau-Goujon's distinctive pastels and are numbered according to arrondissement. The whole is dissected and mounted on linen in thirty six panels and can be neatly folded into its original linen binder. This map is clearly meant to be unfolded and displayed on a wall and to facilitate this mounting eyelets have been set into the margins of the map. Andriveau-Goujon issued this map in several editions from 1858 to 1869. This is the second state and possibly the rarest being the only example of the 1860 edition we have identified in any collection, public or private. An extraordinary find. Eugène Andriveau-Goujon (1832 - 1897) was a map publisher and cartographer active in 19th century Paris. Maps by Andriveau-Goujon are often confusing to identify as they can be alternately singed J. Goujon, J. Andriveau, J.Andriveau-Goujon, E. Andriveau-Goujon, or simply Andriveau-Goujon. This refers to the multiple generations of the Andriveau-Goujon dynasty and the tendency to republisher older material without updating the imprint. The earliest maps to have the Andriveau-Goujon imprint were released by Jean Andriveau-Goujon. He passed the business to his son Gilbert-Gabriel Andriveau-Goujon, who in 1858 passed to his son, Eugène Andriveau-Goujon, under whose management the firm was most prolific. Andriveau-Goujon published numerous fine pocket maps and atlases throughout the 19th century and often worked with other prominent French cartographers of the time such as Brue and Levasseur. The firm's stock was acquired by M. Barrère in 1892. Very good. Verso linen has been reinforced. Folds into original linen binder. Vallee, Leon, Catalogue des plans de Paris et des cartes de l'ile de France, (Bibliotheque Nacionale) 2674 - 2679.